ISSUE #3 How do you manage your time? What’s your secret to tackling the mountain of work that never seems to end? 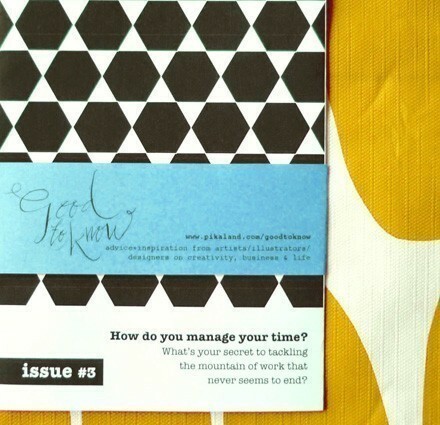 ISSUE #3: How do you manage your time? What’s your secret to tackling the mountain of work that never seems to end? The Good to Know Project is full of advice + inspiration from artists/illustrators/designers on creativity, business and life. This issue has 29 artists who shares about the topic of how they manage their time, and includes some of their illustrations as well! Also included in this issue is a link for you to download a FREE PDF of an instruction sheet and a printable template for a tiny to-do list jotter. Measurements: Zine is A5 sized, 40 pages, staple-bind.